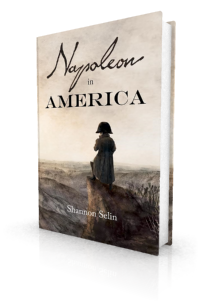 In writing Napoleon in America, it was easy to find French exiles in the United States in the early 1820s who could fictionally help Napoleon carry out his schemes. From Napoleon’s brother Joseph Bonaparte to scoundrels like Louis-Joseph Oudart, many Bonapartists fled to the United States after Napoleon’s 1815 defeat, to avoid persecution by the government of Louis XVIII. Some, like Simon Bernard, were relatively content in their new land. Others, like Louis Lauret, wound up miserable. 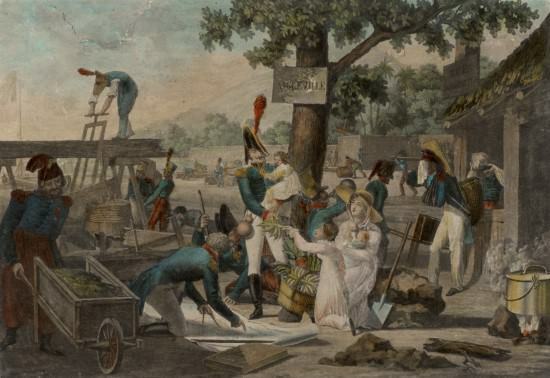 What was the American attitude toward the Napoleonic exiles in their midst? Initially, the Napoleonic exiles were esteemed for their wealth and their military expertise, as indicated in this letter from a resident of New York, dated May 23, 1816. In so large, opulent, and of itself so populous and busy a city as New York, the addition of a few thousand individuals could scarcely make any difference; but in our places of public resort the presence of so many foreigners becomes very perceptible, and the many emigrant Frenchmen now here are not without influence on the tone in society, There are at present in this place a multitude of French ex-dukes, counts, barons, ministers, and counsellors of state, high officers of court and state, both civil and military, who have all brought more or less money. Joseph Buonaparte lives here without any great show…. He seldom visits in the societies of this city, and his circle is chiefly confined to Frenchmen. He lately made a journey to Philadelphia, where he was accompanied by Marshal Grouchy and General Lefebvre Desnouettes. In Lansdowne, where he resided for some time, General Clauzel was also in his suite. Regnault de St. Jean d’Angely has recently returned to New York from Charlestown, where he purchased 10,000 acres of land in South Carolina…. In March 1817, Congress granted a number of the French exiles land in Alabama, near the present site of Demopolis. Sympathy for the Napoleonic exiles started to evaporate when many of those who had stakes in the Alabama colony sold their land grants to help finance an armed expedition to Texas, which was then under Spanish rule. In 1817, 22,240 people arrived at US ports from abroad – an unprecedented number. (4) There was concern that American generosity to the French exiles could set an undesirable precedent when it came to other immigrant groups. It was the abuse of the Alabama grant that caused the rejection of the petition of the Irish emigrant associations for the laying off a tract of land in the Illinois, though everybody felt satisfied that their design was an honest one…. “French Exiles in America,” The Times (London, England), August 8, 1816. [From the New Orleans Commercial Press], The Supporter (Chillicothe, Ohio), July 29, 1817. “Emigrants,” The National Advocate (New York, NY), July 27, 1818. Dennis Wepman, Immigration (New York, 2008), p. 94. “Emigrants,” The National Advocate (New York, NY), August 11, 1818. “French Emigrants,” Niles’ Weekly Register (Baltimore, MD), August 8, 1818. Blackwoods Edinburgh Magazine (Edinburgh, UK), Volume XI, January-June 1822, p. 685. “From Louisa Catherine Johnson Adams to John Quincy Adams, 27 August 1822,” Founders Online, National Archives, last modified November 26, 2017, http://founders.archives.gov/documents/Adams/99-03-02-4144. Thanks. I’m glad you enjoyed the article. Accounts of the Napoleonic exiles tend to mention only the higher-ranking military men and government officials. I imagine there were quite a few in the lower ranks who (if not forgotten) are remembered only in local or family lore, or on such telling tombstones. Among the splendid fooleries which have at times amused a portion of the American people, as well as their Representatives in Congress, was that of granting, on most favourable terms, to certain emigrants of France, a large tract of land in the Alabama territory, to encourage the cultivation of the vine and olive.